It is often stated that the 1950s was the era of rock ’n’ roll. Yet, rock ’n’ roll music was not the only burgeoning aspect of life that this decade harbored. During this exciting time, The Campanile faithfully documented events at Paly and in the Palo Alto community. Today, these records offer a glimpse into our past, from revolutions to civil rights and war protests to pop culture. This section of Paly’s history, spanning 1950-54, focuses on the outspoken nature of Paly’s students. Addressing the social problems in the aftermath of World War II and the efforts to help those in need as much as possible, these years witnessed our community become more socially conscious than ever before. Sixty-eight years ago, The Campanile reported on the students’ disappointment with the optimistic yet false promises made following World War II. Despite predictions that 1950 was the dawn of a new America, cities across California, including Palo Alto, continued to be plagued by overcrowded jails, mental hospitals, old-age homes, orphanages and schools. Students complained of congested, unusable highways and polluted cities. To address these issues, The Campanile advocated for people to work together as the only solution to make 1950 the “year of opportunity,” and spur the progress that was promised but not delivered a decade after World War II. Today, Paly students continue to advocate for social reform, most recently in the National School Walkout protest that advocated for increased gun control. At a city level, Palo Alto has made strides in improving our public schools and pollution standards, but heavy traffic and overburdened services continue to be a challenge. Not long after World War II, the United States found itself embattled in the infancy of the Cold War — this time on the Korean Peninsula in 1952. As the pressures of wartime began to weigh on the Paly community, students and teachers collected clothes and bedding as part of a clothing drive to support the needy. In total, Paly contributed 1,411 pounds of clothing and bedding to the war effort, and 750 pounds of clothing were subsequently shipped off to Korea. The drive was orchestrated as a competition between 33 sections of the student body, and the winner of the contest was given a theatre party by the Varsity Theater organization. Today, many Paly students are active in clubs and organizations that offer volunteering opportunities to serve the community. The latter half of the 1950s was marked by an increase in student enrollment and diversity in Paly’s student body. As Palo Alto offered more opportunities for prospective homeowners and workers alike, Paly’s needs, culture and student wishes shifted as well. Luckily, The Campanile kept up with Paly students’ ideas to address new campus issues during this time period. This period of Paly’s history, from 1955-60, was characterized by Paly students’ growing interests in extracurricular activities and the support administration provided to the students like incentives for improving overall campus life. Five years after the 20th century’s halfway mark, Paly students’ talent and enthusiasm were just as rich as they are today. In an editorial article, The Campanile advocated for the creation of a school debate society in light of Paly’s widespread argumentative enthusiasm and other Bay Area high schools’ efforts to organize formal debate programs. Many faculty emerged as very supportive of the idea. Paly students themselves supported founding a debate team in spite of the cost overhead the team would generate. First, they claimed a debate team would offer rewards to the school, mainly the trophies and honors they symbolize, from success in competition and contributions to the reputation of Paly. Second, they suggested that the fun and camaraderie of arguing and counterarguing would easily provide enough reward for the significant time and work investment. Third, they argued that the mental development, quick thinking, skillful reasoning, teamwork and mental self-reliance teach life-long lessons no matter what one makes of their life. Today, Paly’s Speech and Debate team maintains a high-achieving lineup of both debaters and speechies with three students qualifying to the 2018 California Speech and Debate State Championships, the highest caliber in the state. Just as the increase in student enrollment prompted the introduction of activities such as debate, systems to ease daily commutes emerged as well. In this time period, droves of Paly students could be found walking to school on a daily basis. The Campanile proposed an interesting idea for Paly’s own transportation service as a quick, regular way of getting to school each morning. As a result, organization members would give rides to other students so they would not have to walk, and in return for their good deed, members would receive service points in accordance with the time they spent taking students to school or home. Every quarter, the Point Award Board, a committee that rewarded service points to students for positive efforts, would doll out points to those members of the transportation organization for improving school climate as a whole. 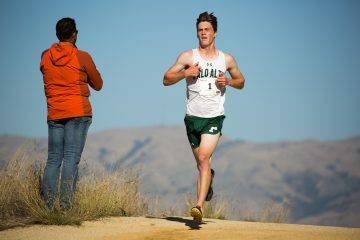 Today, many Paly students walk, bike or drive to school, and the need for such a committee is void due to Paly students’ already-intense involvement in extracurricular activities. In the first half of the 1960s, a debate about the role and purpose of student government raged across campus. In October 1962, the student court declared that an official trial did not need happen for a student to be given punishment, which The Campanile responded to with a scathing editorial. Months later, in February 1963, The Campanile would follow up with an editorial labelling the institution of student government useless. The editorial board formally requested that student newspapers stop covering the student government and their actions. The student government debate took the backseat in December, following the assassination of President John F. Kennedy. Replacing the editorials about the student government was a large article titled “What protects man from irrational men?” bemoaning the tragic impact a single individual (Lee Harvey Oswald) could have on the lives of so many. Ironically, directly below it was an article about a school dance getting cancelled due to the drunken state of a few attendees. This momentary disruption did not prevent further coverage of the student government in the following months. The Campanile documented the revision of the school’s constitution, multiple changes of position and ultimately, the disbanding of student government at Paly a few years later. 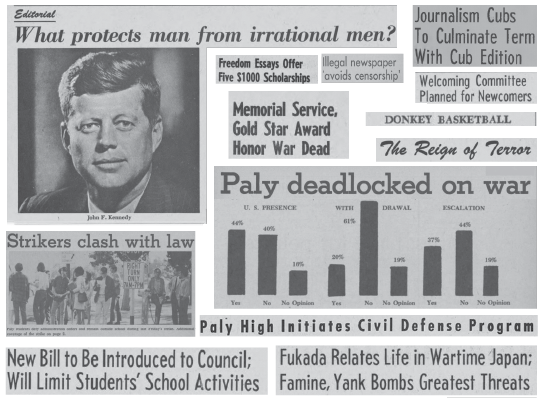 As the second half of the sixties unfolded, Paly students became increasingly politically engaged, clashing with the administration and with each other over issues of freedom and open discourse. A poll taken in February of 1968 showed the student body divided over the war in Vietnam. This was not the first time The Campanile had covered student perception of the war; in October 1967 an interview with a Vietnamese exchange student was conducted and published to provide additional insight. In May 1968, the first ever Paly student walkout occurred, protesting the administration’s desire to clamp down on speech it deemed unacceptable. Continuing the issue of free speech, an underground, non-approved publication began to distribute itself on campus. “Some students started something called Radio Free Heaven, to be an underground newspaper. I didn’t write there, but I almost got suspended because I was in favor of distributing it, and the principal wanted to make an example of me. According to Raffel, the publication didn’t get attention before the administration got involved. First, it only applies to public schools.